Not long ago I came up with a fun idea that incorporates a gift card holder to the front of a card. 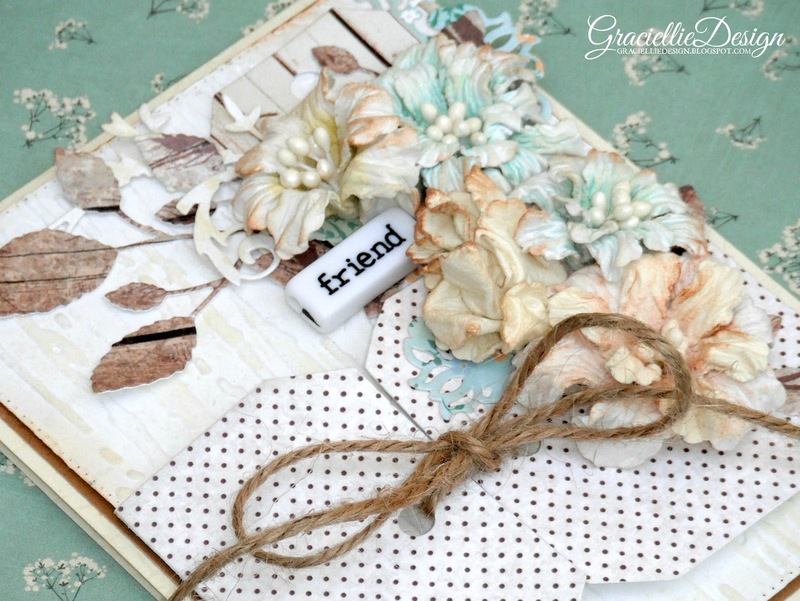 I thought I would share with you a detailed tutorial on how I make this 2 in 1 card and gift card holder, using beautiful Fall neutral colors and a washed Shabby Chic look. To view my tutorial click HERE. Fall inspired cards are always so pretty and even warm neutral colors look great together against a washed looking white background. 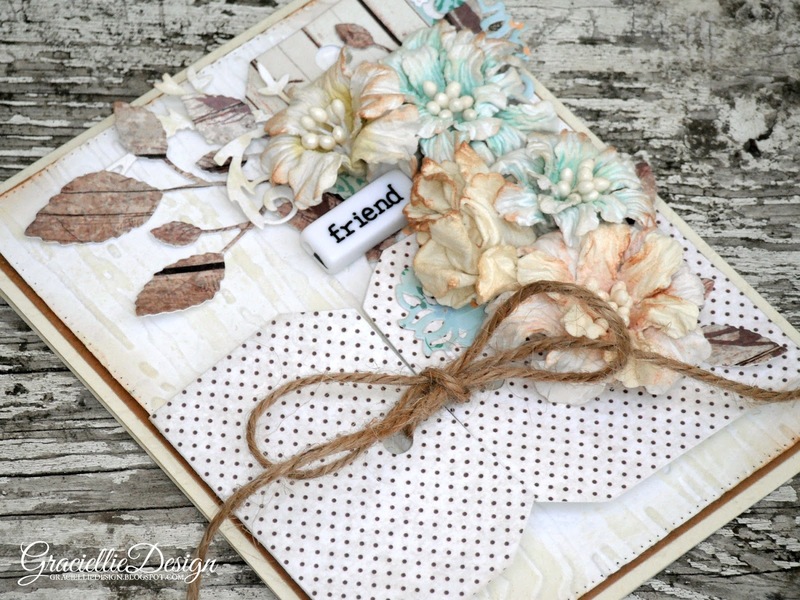 Texture is everything when it comes to Fall projects, so I decided to dry emboss the white layer, add really textured handmade paper flowers and finish the card with jute twine! The touch of distress on the embossed background and flowers give the card a sutile mixed media look! You will find that this card is not so hard to make and I hope also the step by step tutorial is easy to follow! To view my tutorial click HERE. Don’t forget to like and share my guide by clicking on the little heart on the tutorial’s cover and/or by commenting below this post! Hope you enjoyed today’s post! Very pretty card. I love the softness of the flowers. 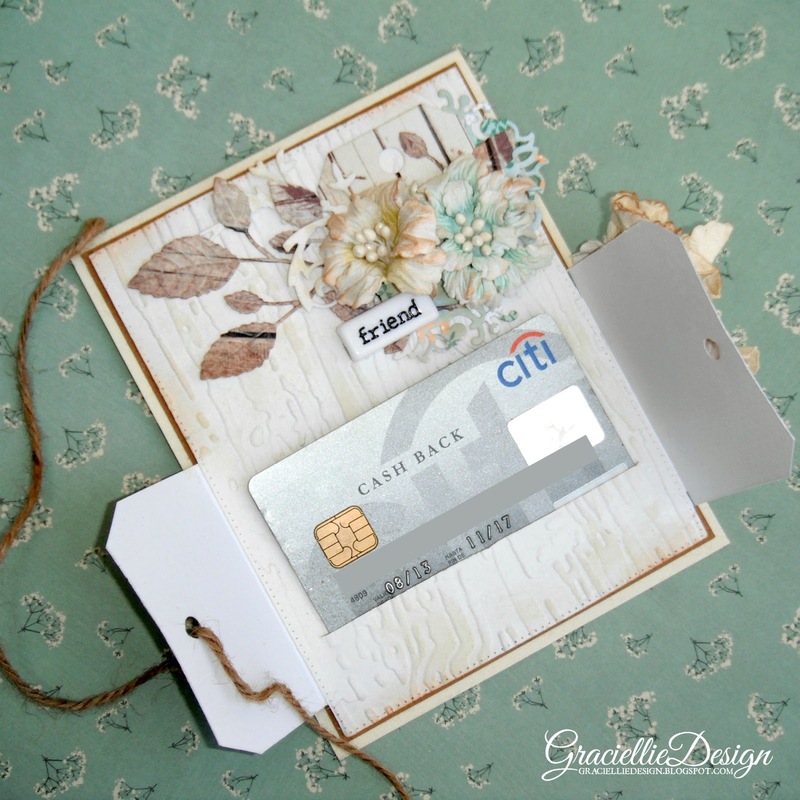 what a gorgeous card Gracie – beautiful colors and absolutely love the way you made the gift card holder – this is a keeper – definitely am going to CASE that idea. and thanks for your comment on my blog – good luck at Card Concept – your card looks like a winner to me! What a gorgeous GC idea! Love your design and will have to pin this. Thanks so much for joining us at Color Throwdown! Lovely, Gracie! What a cute idea. WOW!!! This is sooo elegant…love your gorgeous GC design!!! Thanks for joining us at the Color Throwdown this week!!! The flowers remind me of the last of the ones in the yard that start to imply that fall will soon be here. Beautiful and handy design. The tutorial with all of the pictures was very helpful. Thanks for joining in the challenge this week at the Mod Squad. A beautiful gift card. The flowers are so pretty and the color combo is awesome. Thank you for joining us for the Classy Cards N Such blog challenge. Beautiful card and such amazing flowers! I just love the soft and neutral colors you've chosen. Thanks so much for joining us at Fusion Card Challenge. Your design is beautiful!! I love all the texture on your card, the jute really sets it all off and compliments your beautiful flowers. Awesome way to incorporate a gift card!! Thank you for playing along with the Fusion Card Challenge! Gorgeous card, Gracie. Love the card/gift card holder combination. The flowers and the colours are so beautiful and soft. Love it! Thanks for playing along with us at CardzTV. What a beautiful gift card holder!!! Love the colors and the pretty flowers!!! Thanks for joining us at Cardz TV! This is such a clever idea! I love your shabby chic interpretation, so so pretty. I'm not very good at that style and admire anyone who can carry it off! loving all your flowers. This card is so soft and delicate! Thanks for playing at Fusion! This card is absolutely stunning! You have such a great eye for design and I adore the way you arranged the floral elements so thoughtfully. The color palette is gorgeous and the whole thing looks so sophisticated, yet effortless. I also really like the clever structure of the card. What a great way to present a gift card! Thank you so much for sharing such a remarkable piece with us for this week's Simon Says Stamp Monday Challenge Blog! Oooh, this is gorgeous and practical! Love it! Thanks for joining us at the CAS-ual Chic Challenge! What gorgeous layers Gracielle!!! This is such a clever (and beautiful!) way to package a gift card. Thank you for your sweet comment on my blog a bit ago. I always love to hear from you. Wow!!! Fabulous idea and it is stunning!!!! Thanks so much for sharing it with us here at The Card Concept! Beautiful! 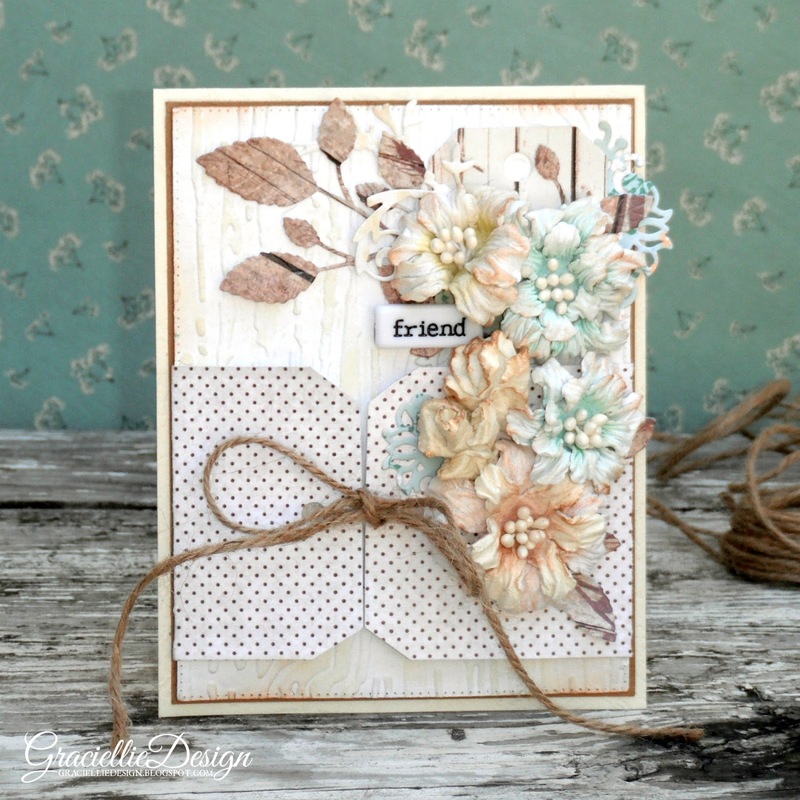 Such a “you” card – classic shabby chic with lots of elegance! Thank you for playing along with CCNS! Gorgeous card, as always! Great tutorial! Gorgeous card, so many pretty elements and pretty colors,Thanks for playing along over at DL.ART! Such a pretty card…..love the gift card element! The flowers are beautiful, love the soft colours too! Wow! This is gorgeous! The flower cluster is beautiful! Thanks so much for joining us in the October Paper Sweeties Challenge!